Home Tags Posts tagged with "Louis Farrakhan Jr."
CHICAGO—The Nation of Islam, with deep sadness, announced the recent passing of Brother Louis Farrakhan, Jr., the eldest son of the Honorable Minister Louis Farrakhan and Mother Khadijah Farrakhan. The family was aware of a previous heart condition and it appears that Louis, Jr., passed peacefully in his sleep at the family home in Phoenix, Ariz. He was 60 years old. The announcement was made on June 2. The funeral, or janazah, service was planned for June 8 at Mosque Maryam in Chicago at 3 p.m. CST. “We extend our love, support and prayers to the Farrakhan family, the family and children of Louis, Jr., the entire Nation of Islam and to all who knew and loved our dear brother,” said anofficial statement from the Nation of Islam. 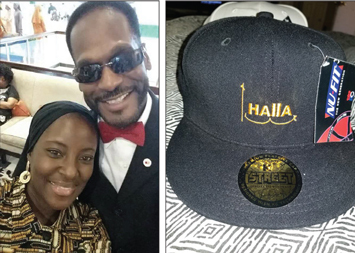 Louis Farrakhan, Jr. and Carmella Muhammad (R) This cap was among products designed and produced by Louis Farrakhan Jr.
“We are deeply, deeply saddened upon the news of the death of Louis, Jr., the eldest son of Min. Farrakhan and Mother Khadijah Farrakhan. I ask all of us to lift the family up in prayer. Louis was a beautiful, beautiful man,” said Ishmael Muhammad, student national assistant and assistant minister to Min. Farrakhan, on June 3 at Mosque Maryam. “All who knew Louis, he would light up any room. He had a great sense of humor. He was so brilliant and a very highly intelligent man, very kind, compassionate, warm, generous, always would lend a hand, always helping, would always go the extra step, the extra mile,” said Ishmael Muhammad, a son of the Hon. Elijah Muhammad. We lost a beautiful son, soldier and comrade in the struggle who loved the Hon. Elijah Muhammad, the Nation of Islam and his father, added Ishmael Muhammad. We lift his family up in prayer, especially his children, Louis Farrakhan III, Khadijah Farrakhan, Khaladay Farrakhan, Saffiyyah Farrakhan and Wakeel Farrakhan, he said. Life is not guaranteed so we should resolve to live our lives as God intends and treat people as we would like to be treated because we never know when the evil accident of time will come, Ishmael Muhammad continued. To avoid grief over how we treated or mistreated loved ones or acquaintances when death comes, we should follow the Golden Rule, he said. 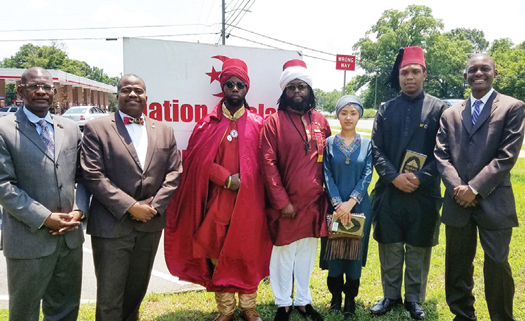 Members of the Moorish Science Temple came to Muhammad Mosque No. 36 June 3 to show respect and solidarity for the passing of Louis Farrakhan, Jr.
David Banner, activist and rapper, with Louis Farrakhan, Jr.
Louis, Jr., had the ability to see into the future and a world coming in that many people cannot envision, she said. He was advanced spiritually and scientifically in his ability to see that things could be done so much better than they were being done, said Ava Muhammad. She expressed gratitude that she and her husband had been able to spend time with Louis, Jr., in Phoenix during recent Nation of Islam events in the area. “We pray for the family of our dear Minister and his family at this time,” said Richard B. Muhammad, editor in chief of The Final Call newspaper. “Brother Louis was a great friend to me, a brother, a Muslim, a Believer and was a joy to be with. We thank Allah (God) for giving us this great one. We will never forget his place in our heart and his work in this great mission. Long live the spirit of Louis Farrakhan, Jr.,” said editor Muhammad. The weekend of his passing, social media pages were flooded with photos of Louis, Jr., and reflections on his life and spirit from Believers in the Nation of Islam and those who knew him.